These gaming laptop deals let you get your game on without breaking the bank. Today's roundup of the very best cheap gaming laptop deals just goes to show that you don't have to spend over the odds for a great gaming experience on the go. You can get a great gaming laptop for under $1000 that's more than capable of meeting your needs. Indeed, there are plenty of cheap models available for far less than this (or under £1000 if you're in the UK). So sit back and let us find one that gives you the biggest bang for your buck. That's right, you've come to exactly the right place to find the best cheap gaming laptop deals. We've taken care of the legwork and compiled the best prices from around the web. Whatever your budget may be, you're sure to find something at the right price while still being able to deliver an exciting gaming experience. Directly below you will find the best deals we've found this week. Further down the page, you'll see our picks for the best cheap gaming laptops that regularly retail for less than $1000. Now $120 cheaper. Walmart has a few G3 gaming laptop deals this week. This version is a bit more than the similarly-specced cheaper one, but comes with a 1TB hard drive and 16GB of Optane storage. You're also getting a GTX 1050 graphics card and 8GB of RAM. MSI gaming laptops are highly sought after and we're loving the $250 discount on this one today. The GL63 comes loaded with an 8th-gen i5 processor, GTX 1050 graphics, 1TB HDD and 8GB of RAM. 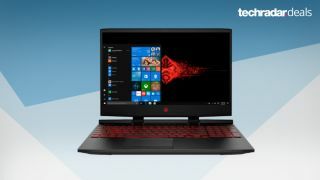 While we're got gaming laptop deals at a similar spec for less on this page, most struggle to compete with the build quality of MSI offers for gamers. The HP Pavilion 15-CX0056WM gaming laptop is super hot at this low price. We're talking GTX 1050 Ti graphics, 1TB HDD and 8GB of RAM all for under $700. A fantastic gaming laptop deal that comes with an i5 processor, Nvidia GeForce GTX 1050 graphics card and a 1TB HDD. All in all, a fantastic price, even more so given the large 17.3-inch Full HD screen. If you'd like a touchscreen on your gaming laptop for some extra functionality then this HP model is worth a look. It also sports Intel UHD graphics 620, 1TB HDD, 8GB of RAM, 16GB of optane memory and an 8th-gen i5 processor. Now $100 cheaper. Walmart has a few G3 gaming laptop deals this week. There's a large (and very fast) a 256GB SSD instead of a regular HDD. You're also getting the GTX 1050 graphics card and 8GB of RAM. So if you prefer speed over quantity for storage, this is the better offer over the larger capacity versions. This is the cheapest gaming laptop deal of the week with an 8th-gen i7 processor. You also get a sweet combo of 128GB SSD and 1TB HDD, 8GB of RAM and a GTX 1050 graphics card. A very affordable 15-inch gaming laptop. This HP is equipped with an IPS 1080p display, AMD Radeon RX graphics, a Coffee Lake i5 processor, 8GB RAM, and a 128GB SSD and 1TB HDD combo drive. This sweet gaming laptop deal nets you a 15.6-inch, 1080p display powered by an 8th-gen Intel Core i7 CPU, Nvidia GTX 1050 graphics and a 1TB hard drive. With features like Intel Optane memory and Nvidia GeForce GTX 1050 graphics, this HP Omen laptop will give you a great gaming experience wherever you take it. It also comes with a Kaby Lake i7 processor, 8GB RAM, and a 1TB HDD. Better yet, it's $200 off list price. This stacked gaming laptop – with a 15.6-inch, 1080p display at 120Hz, a 128GB SSD and 1TB HDD combo, and Nvidia GTX 1050 Ti graphics – can be had for $190 off the list price. If you can push that budget to the upper limits we've found a seriously powerful gaming laptop for under $1000. We're talking GTX 1060 graphics (instead of the usual 1050 on cheaper models), 256GB SSD, 8GB of RAM and an i5 processor. The lack of regular storage is a bit of a letdown, but if you can keep a better eye on how many large games you have installed at once, the 256GB SSD should be plenty and that 1060 graphics card is awfully tempting. Need some extra functionality from your gaming laptop? Then how about this 2-in-1 model with a touchscreen? It's excellent for both work or casual reading and watching movies in tablet form. With an i5 processor, 8GB of RAM, 1TB HDD and GTX 1050 graphics card it'll multitask and game with ease too. Walmart is really packing in these sub $1000 gaming laptop deals this week. This one's packing a lot of heat for the price too with an i7 processor, GTX 1050 graphics, 128GB SSD, 1TB HDD and a serious 16GB of RAM. This one's not messing around. Save $200 on the Legion Y7000 gaming laptop that will elevate your gaming experience for just over $1,000. The 15.6-inch laptop packs 8GB of RAM, 512GB SSD, GeForce GTX 1060 6GB graphics card, and an 8th-gen i7 processor. Save a few hundred on the MSRP and get Call of Duty: Black Ops 4 for free with this gaming laptop deal. Those are some tempting incentives if you want to go beyond that sub-$1000 budget. This Asus pulls no punches with an 8th-gen i7 processor, GeForce GTX 1060 6GB graphics card, 1TB HDD, 256GB SSD and 16GB of RAM. Battle ready to say the least. If you’re looking to save some cash on your next gaming laptop, the Dell G3 15 will provide a competent gaming experience while costing much less than the competition. The laptop comes equipped with more than serviceable Nvidia graphics behind a fine, 1080p display, almost betraying its awfully affordable price point. Just don't expect the highest-quality build or absolute latest features, like USB-C.
Look past the cheap plastic back cover, the basic keyboard and it hefty weight. Because within that rough exterior lies a gaming laptop with deep user control over cooling, decent battery life and suitable gaming performance for the price tag. This gaming laptop is definitely more down with the gamer aesthetic than others at its price point, and so will attract a certain customer. But, in the end, it's a fine gaming laptop for cheap all the same. The newly Max-Q-powered Dell Inspiron 15 7000 Gaming shows lots of promise, what with its modest pricing and capable performance. All things considered, this redesign successfully keeps to a mainstream aesthetic while bringing a solid amount of power to those middle-of-the-road consumers. After all, Nvidia Max-Q doesn't have to be exclusive to the high-end.